Comprehensive review of Tera's Whey Goat Whey Protein. See what real experts and actual users have to say about this protein powder. 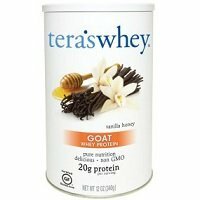 Tera’s Whey Goat Whey Protein is very versatile and definitely unique, so I give it 3 out of 5 stars. It uses whey from goat milk, as opposed to cow, which makes it great for those with sensitivities to dairy. Goat milk is very similar to human milk, making it much easier for us to digest! And it’s still packed with all 9 essential amino acids and 4.92g Branched Chain Amino Acids (BCAAs). This company goes the extra mile and really puts quality into their products. It’s also very pure and natural and they use organic ingredients wherever they can. It’s gluten free, soy free, non-GMO, and certified Kosher. I felt great supplementing with it! I’d drink it as a morning wake-up shake and at night as a post-workout recharger. It is pricier than your average protein powder, though. And I couldn’t find a guarantee, so that’s a bummer. Sometimes it doesn’t mix as well as other protein shakes and the flavor is pretty tart on its own. But I still really enjoyed testing out this protein powder and I’d mix it with milk substitutes and it enhanced the flavor so much. Overall, this is a really unique protein powder that can be utilized by all sorts of people. This protein powder doesn’t mix quite as well as other protein powders I’ve tried. I especially noticed it when I used a shaker cup and water. But the directions are simple; just add 2 heaping scoops of protein to 6-8 fl oz of water, milk, or your favorite juice. Then mix in a shaker bottle or blender. I got this protein in the Vanilla Honey flavor. It’s pretty tart and tangy when you just mix it with water. If you’ve ever had goat’s milk or goat yogurt, then you’ll know what I mean. The flavor is really subtle and it’s not sweet at all. I mixed it with almond milk and coconut milk and it tastes delicious. I’m actually really impressed with these macros. I wasn’t sure how goat whey would compare to cow whey, but it holds its own pretty well. Each serving (2 scoops – 28g) contains 20 grams of protein, 1 gram of fat, and 6 grams of carbs. And there’s 110 calories per serving. These are great numbers that could assist a great deal of people with their fitness goals. 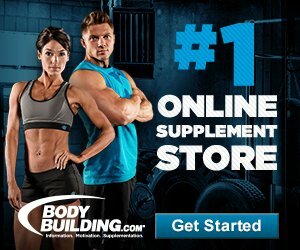 This supplement is unique because the sole protein source is Goat Whey Protein Concentrate. Goat whey is an awesome, nutrient-dense alternative to regular cow whey. Goat whey is much easier to digest because it’s the closest thing to human milk. It’s a great option for adults and kids with dairy sensitivities. There are 20 grams of protein per serving and it has all 9 essential amino acids and 4.92g Branched Chain Amino Acids (BCAAs). The whey is ethically sourced from small family farms and artisan cheese makers in Wisconsin. It’s certified gluten free, cold pressed, and non-denatured. It’s soy free, certified Kosher, and non-GMO. This company uses pure, natural ingredients and organic whenever possible. It does obliviously contain goat milk. And it also says it may contain trace amounts of cow milk. A huge benefit of this protein powder is that it’s super easy to digest. I felt great each and every time I drank it. I’m sensitive to dairy and I definitely could tell this protein was much easier to digest. Tera’s Whey Goat Whey Protein has a lot of different uses. The number one I’d say is for people who are sensitive to dairy. Goat protein is much easier to digest compared to whey protein from cows. It can also be used for many other goals, diets, and lifestyles. It would be a great supplement to help lose weight, tone up, and add muscle. You can buy this protein powder from a number of different places like Costco, Thrive Market, iHerb, Vitamin Life, and Target. I bought mine on Amazon for $25.00 for a 12-ounce container. That works out to 9.6 cents per gram of protein. That’s definitely on the higher end and more expensive than your average protein. However, I’d consider it a specialty protein since it’s unique and only uses goat whey protein. Even though it’s pricier, I think it’s a good deal and worth the cost! Unfortunately, I couldn’t find a guarantee on their website but you might be able to get a refund if you buy it online at Amazon or at certain retailers. To buy Tera’s Whey Goat Whey Protein, click here.